Lucky for me, I’ve encountered my fair share of icky things. My previous job took me all over the state of Colorado and I had the pleasure of lodging in a wide variety of establishments. Some were your run of the mill mid-level chain hotels; others were small, outdated and sometimes a little scary. 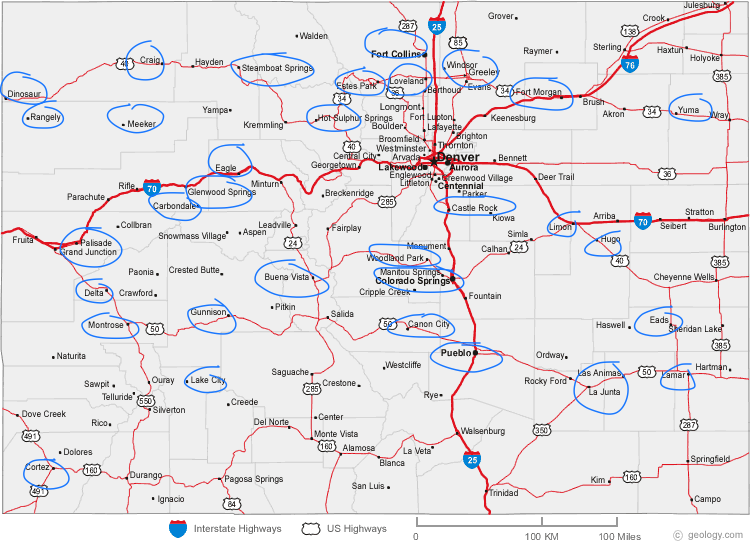 All the places I visited for my last job. My favorite was Dinosaur in the top left corner. The streets are named after dinosaurs, like Brontosaurus Blvd. and Tyrannosaurus Trail. But my worst experience has to do with, of course, bugs. It’s strange how it happened. It was like fate or something. I was talking about an upcoming trip with a coworker and I told her where I was going. She gasped and her eyes widened. “Where are you staying?” she asked. She explained that another group had just been in that area and the hotel where we usually stayed had, gulp, BED BUGS! A pair feeding on a willing host. We proceeded to Google everything we could about the awful creatures–what they looked like, how to find them, what to do if you find them. My brain absorbed the information like a very frightened sponge. Did you know they can live about a year without eating, depending on their environment? They can survive temperatures below 14 F (-10C) for five days and it takes 7 minutes of temperatures above 115 F (46 C) to kill them. In fact, many exterminators use heat to rid homes of the pests. The house is brought to temperatures above 120 F for at least 4 hours to zap the critters. Now, they do have natural predators, but who wants to unleash scores of cockroaches, ants and centipedes in their house!? Hello there. For just a few crumbs a day, I can help you with your bedbug problem. Don’t mind me. 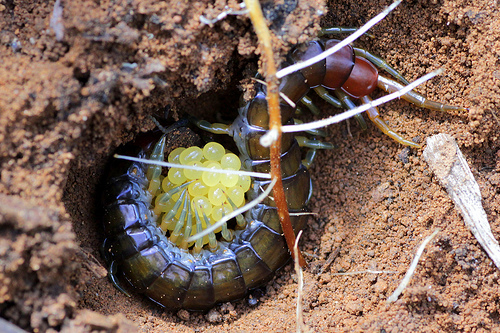 Just making centipede babies. You did say you had a bedbug problem, didn’t you? Prior to the mid 20th century they were quite common. On History.com it’s noted that in 77 AD they were thought to heal snakebites, ear infections and other ailments. According to Bedbugs.org, about 1/3 of homes in America had them in the early 20th century, with nearly every residence in some areas infested. And it looks like they’ve made a comeback. According to a Time Magazine article, the number of reported incidents in New York City alone rose from 500 in 2004 to 10,000 in 2009! And lucky for us, humans are their favorite food. A few days later I set out on my trip, booked at a hotel in a nearby town. I lugged my giant suitcase and oversized wheeled bag up the stairs and pushed the door open. Right away I knew something was wrong–the headboard was off the wall and on the floor, propped against the wall. That’s strange. The bugs are often found behind the headboard. I took out my flashlight, just like all the websites said to do, and peeled back the blankets. 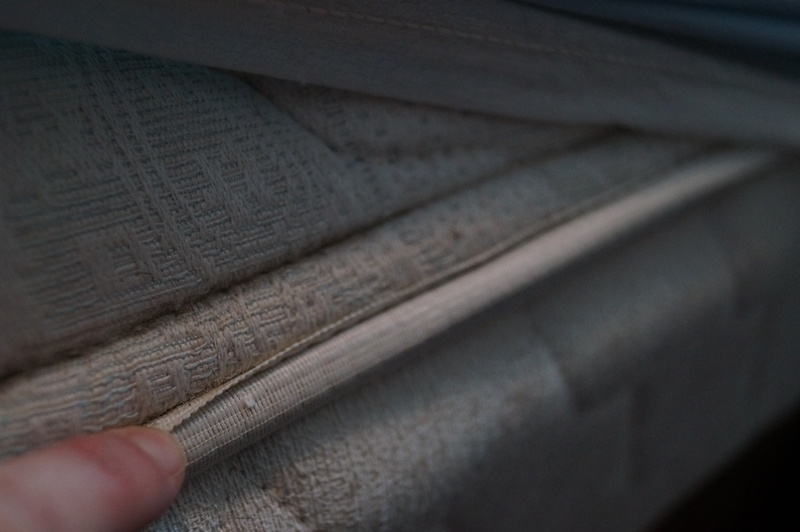 My fingers pulled the thick cord around the edge of the mattress back. Nothing. Then, I lifted the tiny strip of fabric at the seam and looked for any signs of bugs. One of their favorite hiding places. First, I found a shedding (they go through a molting process where they shed their exoskeleton). Then there were spots of blood. Then I saw it. It looked a little different than the ones I saw on the internet, more translucent (turns out he was a nymph–still a baby). 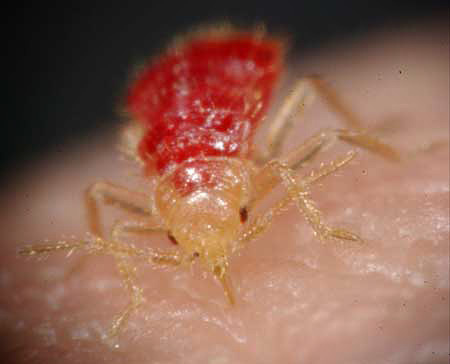 Bedbug nymph feeding, also on a willing victim. He remained still, hoping I wouldn’t notice him. I poked him with the edge of my keycard. He took a couple of steps. I gasped and went into full fight or flight mode. My adrenaline pumped, my heart raced. I nearly passed out. I’m not sure why my reaction was so severe, it’s not like he was going to leap through the air and latch onto my face. Right? I backed out of the room, tripping over my bags and let the door slam shut. Down the stairs I went, my suitcase nearly tumbling down without me. A lady passed by, giving me an odd stare. “I need to check out,” I said to the front desk clerk in a hushed voice. “May I ask why,” the woman responded. I looked to either side and then leaned forward. “You have bedbugs,” I whispered. She stepped back and cleared her throat. “All right,” she said. That was it. No argument, no apology. No ‘I’m sorry we almost made a meal out of you. Here’s a coupon for a free breakfast’. I got in my car and panicked. Where was I going to stay? The next closest hotel was the one the last team said had bed bugs, but that’s where I headed. The man at the front desk greeted me cheerfully. Yeah, but I wasn’t going to be fooled. The lady at the last place was just as cheerful as she put me in a bedbug filled room. “I have to ask you something before I book a room,” I said to the man. “Do you have bedbugs?” I whispered, trying to read his face. He paused, startled by my question. Then he insisted that they did not. I scoured the room, tearing the bed apart. I looked behind the pictures on the walls, around the baseboards, anywhere I thought one of those awful critters would lurk. There was nothing. That night, I woke up almost every hour, flicking on the light, waiting for bugs to scatter, but there was nothing. The next morning I searched for bites, certain one had gotten me while I slept. Luckily, I was fine. A little itchy and paranoid, but fine. When I returned to the office I reported the hotel to Consumer Protection. And yes, at least five rooms were infested. The inspection report was detailed, to say the least. Multiple nesting sites, sheddings, eggs around the baseboards. The hotel knew about the problem and had been trying to get rid of the bugs. How nice of them to book me in a room known to be infested (that was why the headboard was off the wall). Of course, I’m now the crazy person who checks every hotel room while my family watches with amusement. I used to check all clothes before I brought them into the house, but let’s face it, I was too lazy to keep that up. I am buying an RV immediately or you are coming with on every trip I take! I still say we were better off with the DDT, at least we didn’t have a bedbug infestation and I have heard Colorado is up there with the worst states for bedbugs. I know. I’ve thought about the RV thing. I think it would be fun just to take a trip in one, but I love finding cool hotels/B&Bs to stay in, so I don’t think I would ever give that up. I just make sure to check every room right when I check in. He he. It’s funny how reading about bugs can make you itchy. Not really, I was just younger and dumber. I once stayed in a hostel that had “Bed Bugs”, “Leave”, “Get Out Now”, written all over the walls in huge letters! I didn’t even know what bed bugs were then…Luckily we did not have any issues there! Ewwwwww! Luckily I have never encountered bedbugs while travelling! Now I will know where to look. Or maybe I’ll just take my sleeping bag next time and camp out in the wild! That was my only time so far, but they’re becoming more and more common. And the scary part is not necessarily being bit, but taking a couple of hitchhikers home with you. They can set up shop pretty quickly and are hard to get rid of. You could be safer in the wild! I saw this post and immediately thought “mosquitos.” As far as itchy goes…I get bite SO much!! Can’t believe the hotel lady didn’t even argue with you. So gross! You continue being careful! I know how awful they can be. My brother attempted to get rid of them in his apartment for WEEKS! Yuck! Oh, I hate mosquitos. They are one of the only bugs I kill. I practice catch and release with most bugs I find in the house, but mosquitos I can’t stand. Yeah, I think the lady at the hotel was pretty shocked when I came back downstairs. Maybe they didn’t expect anyone to look? They are small and pretty flat, so they can squeeze into all sorts of small spaces. I’ve heard of laptops and even between the pages of books. I feel rather itchy and paranoid now. Thanks for that…. Ick! My parents used to run a hotel (and now a B&B) and I’ve had my fair share of finding all kinds of weird horrid stuff guests leave in their rooms and the fact that some people are plainly gross! Luckily we never had bedbugs but my brother and his wife did in one of their homes! Just vile! I’m sorry about your brother. It must have been awful. I understand they are really hard to get rid of and it can be very stressful. Yeah, we’ve had used condoms on the floor, underwear left in the bed, toilets left unflushed. One guy asked to be moved to a cooler room and made my Mum take all his stuff across including a pair of pyjamas sporting rather gross skid marks in them! Yeah the bed bugs were pretty gross. Used a steam cleaner several times! I was super itchy last night after reading this! It’s been better with the B&B as I think people think more of it being your home, while a hotel is more impersonal I suppose! I’m scratching as I type (with one hand), I’ve never experienced any bed bugs, but I’ve heard tales from those who have and it is not a pleasant experience. I can’t believe the hotel did not offer an apology or entice you with a free breakfast or supper. Indeed, they are horrid, nasty little beasties that invade one’s house en masse when warm weather hits and they reek terribly when stepped on or otherwise killed. They are like a plague – Moses should have threatened the Egyptian pharaoh with stink bugs; he would have released the Israelites immediately! The terrible pests migrated to my part of the country about four years ago and they have no natural predators since they are not indigenous to the US. They somehow managed to make their way from Japan – I’m guessing via air cargo. Ahhh! I read it even though I knew I shouldn’t! I now have a major case of the itchies, but at least I know how to spot them now. Eek! This makes me cringe on many levels. I work at a hotel and this is my worst nightmare. Right now the place I work is hibernating in -30 temperatures in Alaska and if we had bed bugs, they’d be dead. 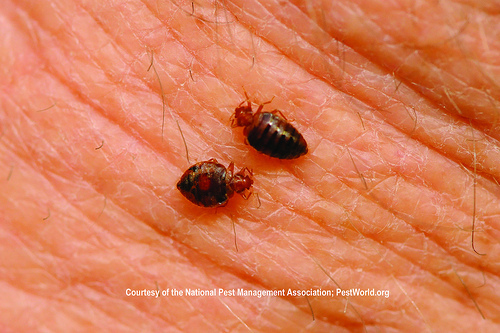 The only cases of bed bugs in Alaska usually are the result of someone arriving with them from the lower 48 so it isn’t a problem. We’ve thrown out mattresses on the suspicion of bed bugs before but never had them. On a personal level, I just know that someday I will be a victim. And now when I stay at a hotel again, I will be inspecting the sheets like you. Thanks.